Manish Pandey (42*) and Dinesh Karthik (39*) took India one step closer to the final of the Nidahas Trophy with a six-wicket over Sri Lanka today. Earlier, brilliant spells from Washington Sundar (2/21) and Shardul Thakur (4/27) had restricted the hosts to a par score of 152/9 in a rain-marred game. Brief Scores : Sri Lanka 152/9 (Kusal Mendis 55, Upal Tharanga 22; Shardul Thakur 4/27, Washington Sundar 2/21) lost to India 153/4 (Manish Pandey 42*, Dinesh Karthik 39*; Akila Dananjaya 2/19, Nuwan Pradeep 1/30) by six wickets. After a rain delay had seen the match being reduced to a 19-over affair, Rohit Sharma won the toss and as expected, with the possibility of rain making another comeback, decided to bowl first. Rohit also announced that India had decided to hand KL Rahul a cap instead of Rishabh Pant who had struggled so far in the series. India got off to the worst possible start as the incoming KL Rahul conceded five runs from an overthrow on the very first ball of the match. On the next delivery, Kusal Mendis smashed Jaydev Unadkat for a six over extra cover. As the next over yielded nine runs, Sri Lanka found themselves at 24 and Rohit knew he needed a wicket. And his bowlers delivered as Shardul Thakur and Washington Sundar came up with wickets in consecutive overs to bring India roaring back into the game. The wickets resulting in the hosts slowing down a bit and by the end of the powerplay could only manage a score of 53/2. Just as India looked to be tightening the knot, Yuzvendra Chahal leaked 17 runs in the 8th over to hand the initiative back to the Lankans. The next two overs, thanks to Mendis who had raced to 48 off 29 balls, resulted in the hosts adding 19 to reach 94/2 at the end of 10 overs. Even though Vijay Shankar got rid of Upal Tharanga in the 11th over, the incoming Thisara Perera hit the Indian for two consecutive big ones to keep the pressure on the visitors. However, that was the extent of the fireworks as he was dismissed in the next over leaving his side at 113/4 in 12 overs. In the next three overs, bowled by Chahal and Sundar, not only did India claw their way back into the game, but took complete control as both the Mendis’ were dismissed with just 10 runs being added to the total. Realizing that the Sri Lankans were struggling to put the spinners away, Rohit decided to give Suresh Raina the ball but the veteran gave away six runs. Shanaka took it upon himself to get his side to a competitive score and he looked to be doing exactly that as, thanks to his efforts, the Lankans were able to add 17 runs in two overs taking the score to 146/7 at the end of the 18th over. Shardul, who was given the responsibility of bowling the last over, repaid his captain’s faith with two wickets of consecutive balls at the cost of just six runs to restrict Sri Lanka to just 152/9 in their allotted 19 overs. India got off to an identical start as their opponents as Rohit Sharma appeared to have recovered from his slump as he smashed Lakmal for 11 runs in the first over. But it proved to be a false dawn as he was back in the dressing room before the next over was done, picking out Mendis at mid-wicket. Two overs later, the in-form man Dhawan was walking back as well after mistiming a shot straight down the throat of Perera at mid-on. With just 30 runs in four overs, India needed a flurry of runs and the incoming Raina was more than happy to provide them. He took 16 runs off the next over to ensure that India finished at a respectable 50/2 at the end of the powerplay. However, Raina’s gung-ho approach didn’t last too long as he perished after mistiming a short delivery to mid off. Manish Pandey and KL Rahul appeared to have consolidated India’s position but with Rahul stepping on his own stumps, the game was back in the balance with the scorecard reading 85/4 at the end of 10 overs. 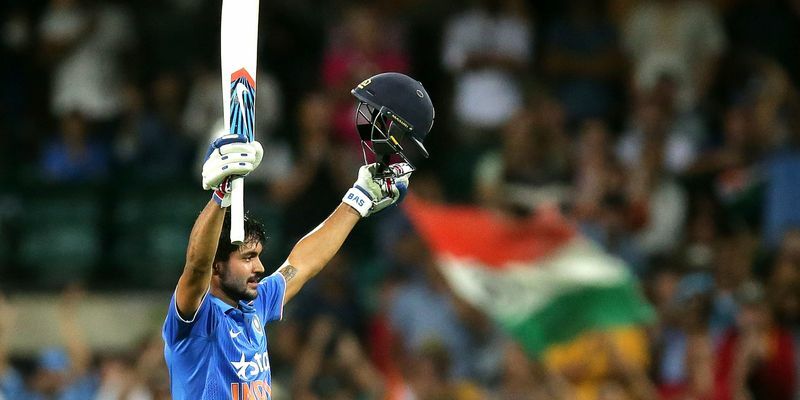 Karthik joined Pandey at the crease with Indian needing a very achievable 68 off 54 balls. However, the duo knew that they had to stay at the crease in order to guide the visitors home. And that was exactly what they did. As Karthik, at least initially, was content with just rotating the strike, it was Pandey who acted as the chief aggressor, hitting Perera for a big one, bringing the required run rate to 7.5 runs an over. With 30 needed off the last four overs, Karthik decided that he had seen enough and went after both Mendis and Chameera taking 21 runs off the target, which meant that India needed just 9 runs off the last two overs. But the Indian wicketkeeper was in no mood to wait anymore and with two boundaries off Fernando’s over, he brought the scores level before a single through point secured the win for the visitors. India are now virtually in the final of the Nidahas Trophy thanks to their superior run rate.